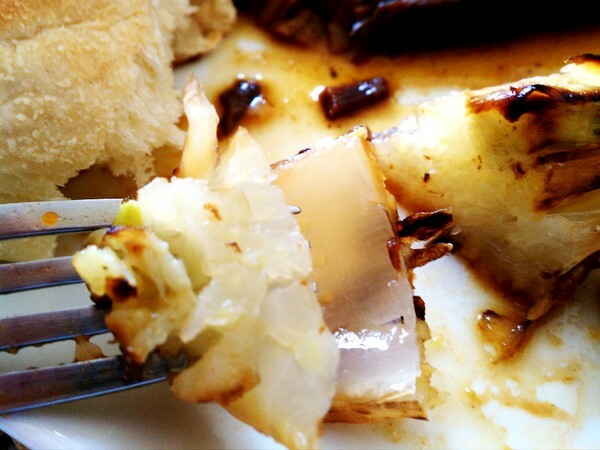 The Daring Cooks: Brave the Braise ~ I Can Do That! Braising is a moist-heat method of slow cooking usually tough cuts of meat which are either partially or fully submerged in liquid. The meat or vegetables are sometimes seared in hot grease to lock in the flavors and to give them a nice color before cooking over low heat in the braising liquid. 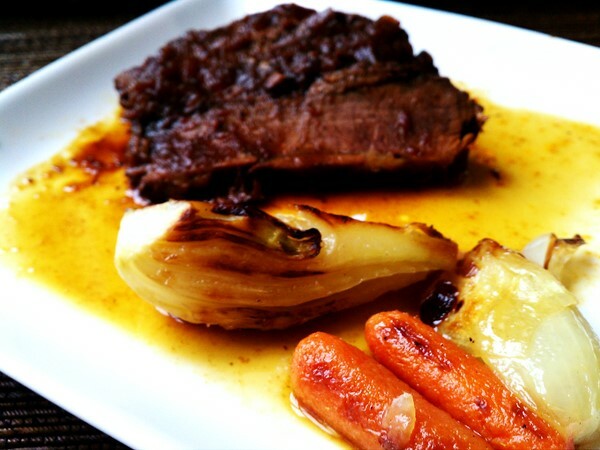 The recipes, techniques, and tips for a perfect braised dish is here. Thank you Carol for a delicious challenge. I adapted the recipe provided by Carol by adding carrots, and one onion. I made this dish as soon as I saw the challenge because I already have fennel bulbs in the refrigerator and because I was curious. I've had them thinly sliced in salad and never thought of braising them. I love it! The anise flavor is mellowed by the cooking but I like the slightly sweet flavor of the whole dish. In a shallow dish or plate, add enough flour to dredge the cut sides of the fennel quarters. In a small pot or sauté pan with a cover, heat the oil over medium to high heat. Add the fennel, flour side down, carrots, and onions, and cook until nicely browned. Add enough water to come up about a ½ inch around the fennel. Add thyme and butter and salt to taste; bring to a simmer. Cover, place in oven, and cook for 20 - 30 minutes, until fennel is tender. Serve immediately. For braised meat, I made one of my favorite Filipino dishes, Humba, pork belly braised in soy sauce, sugar, water, and garlic or onions. It's very simple to make and does not have a lot of ingredients. The braising liquid also is used as the sauce after reducing by half. Preheat oven to 300° F. Sprinkle pork belly with salt. In a cast iron pot, heat oil over medium-high heat; sear pork belly, meat side only. Add soy sauce, sugar, garlic, and enough water to cover ¾ up the sides of the belly. Bring to a boil. Cover and cook in the oven for 3 hours or until tender. Let cool; transfer into a container and refrigerate overnight. 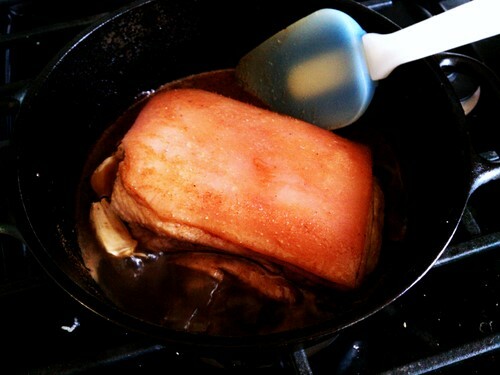 The next day, remove the pork belly from the liquid; remove fat, if any, and discard. Place the braising liquid in a saucepan and let boil until reduced by half. Cut the belly into 1½ inch cubes or into thin slices. Simmer in the sauce until heated through. Serve with rice or steamed buns. I cooked another vegetable dish because it's Lent season and I try to eat meatless dishes on Fridays. This recipe was adapted from Saveur. The dish only has olive oil as the braising liquid and I really love the combination of flavors of the different vegetables. I'd eat this often even after the season is over. In a cast iron pan over medium-high heat, cook olive oil, anchovy paste, red pepper flakes, sun-dried tomatoes, garlic, rosemary, and lemon slices until garlic and lemon are slightly brown, about 5 minutes. Add zucchini slices and cook until browned on both sides. Add potatoes, broccoli, cauliflower, and ½ teaspoon salt, stirring to coat all the vegetables with oil. Cover and cook without stirring, until vegetables begin to brown and soften, about 20 minutes. Stir vegetables gently, cover, reduce heat to medium-low and cook until vegetables are very tender, 45 to 60 minutes more. Remove from heat and add parsley, marjoram, and the remaining salt. Everything looks wonderful. I really want to try braised vegetables, so it's nice to see a variety of them. Everything you made looks delicious. They all look fantastic! Your humba is glorious... love it! Oh wow! So many different and yummy looking dishes. They look wonderful! Yum, yum, YUM. 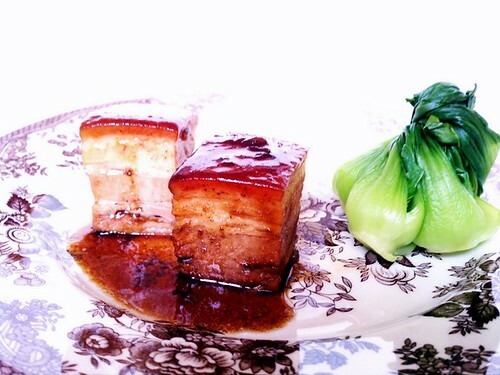 Your braised vegetables look amazing, and the pork belly looks mouthwatering. I have never tried pork belly, and yours just looks SO tempting. Beautiful job. Everything looks delicious, and I would think the braised fennel would pair beautifully with pork belly. Great job Oggie!! Love coming to your blog to check out the challenges! 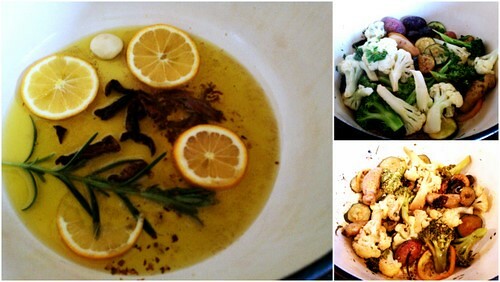 I am loooving your olive oil braised vegetables! Looks good the braised vegetables...and the pork belly looks so tasty. Love it! All three dishes are fantastic, a real inspiration on the challenge! Oggi, each of your braises looks phenomenal! Your fennel especially is to die for - beautiful job! They all look fantastic, but the olive oil braised ones are my favourite - I can just imagine the cauliflower and broccoli - amazing! All your braises look delicious! I am really intrigued by the olive oil and humba, I will have to try them out! Fantastic braising ideas - well done! I thought the addition of the carrots to the fennel was a great idea and I will try it the next time I braise fennel. So glad you enjoyed the challenge!